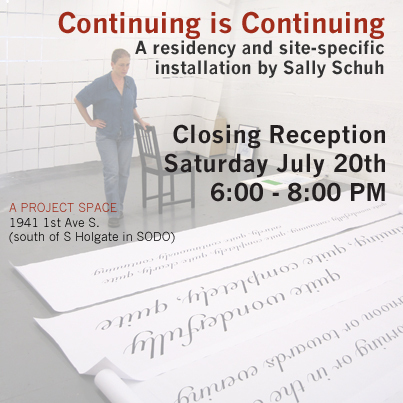 Join us for the completion of Sally Schuh’s installation and the final reception at a project space to celebrate all the artists who have exhibited over the last two years. A Project Space is leaving its current location. 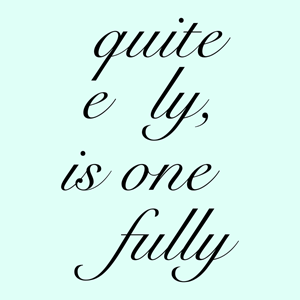 Stay tuned for news about the evolution of A Project Space and what’s next at the website and on the blog. Sally Schuh explores the nature of work during her month-long residency that begins with an opening Tonight, Saturday June 15th, and closes with a reception for the completed installation on Saturday July 20th. I have created a suite of four prints especially for ‘Continuing is Continuing’. A limited edition will be available at a discounted price of $60.00 each and $200 for the set during the residency. Details: 15″ x 11″ archival digital print on pale blue Magnani Pescia paper in a varied edition.